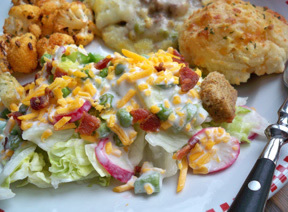 An easy make-ahead salad recipe that pairs nicely along with ham recipes or turkey recipes. 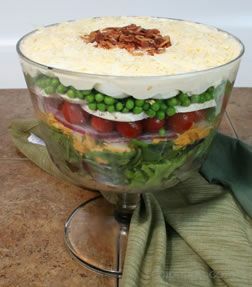 You will find many other salad recipes that are great to serve with ham, turkey, and other entrées. 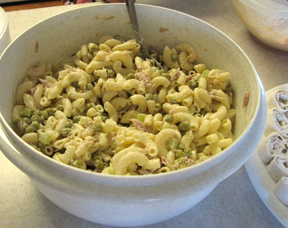 Place peas, shredded cheese, celery and onions in a bowl. In a separate bowl, combine dressing ingredients. Pour dressing over pea and cheese mixture and blend well. If desired, fold in bacon bits. Cover and refrigerate before serving. Doubles easily. *Note:Frozen peas can be used; place the peas in a strainer in the sink. 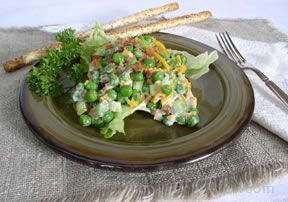 Pour boiling water over the peas to thaw; and then allow peas to cool before preparing the salad. "This recipe is so simple and everyone loved, I prepare it quite often."